Remote workers often work for companies with no central office. The advantage to your employer in this scenario is that they can hire from anywhere in the world. This can introduce the minor complication of having colleagues distributed among several different time zones. What are some strategies to minimize these complications? Keeping your teams as small as possible, as well as your meetings, will make it far easier to find a common, reasonable time to sync up for a quick meeting. Strive to keep people working on the same project within nearby time zones is an obvious way to reduce friction, so fostering a culture that relies on small teams is a good long-term strategy for this. A small but important thing to remember is that time of day is useless without the time-zone! Also, try not to mix different time zones in the same conversation; if someone suggests a meeting time in EST, don't suggest an alternative in PST! Sometimes working in different time zones means showing up for meetings at unusual times of the day. It's not always possible to look put-together at 3am! Recognize that your colleagues might not be bright eyed, bushy tailed, or (ahem) showered yet and allow for an audio call outside normal waking hours. "Tue 8:30am - 4:30pm ET"
whenever we're online. When we're away for something like lunch, we try to put what time we expect to be back (don't forget to include the timezone!). "TACOS!!! Be back at 1pm ET!" It's helpful when hiring to establish a "home base" if you can, and require the team to be online within some number of hours of that home base's time zone. It may be fine to work outside that home base, but require any new hires to be online with a reasonable time overlap. 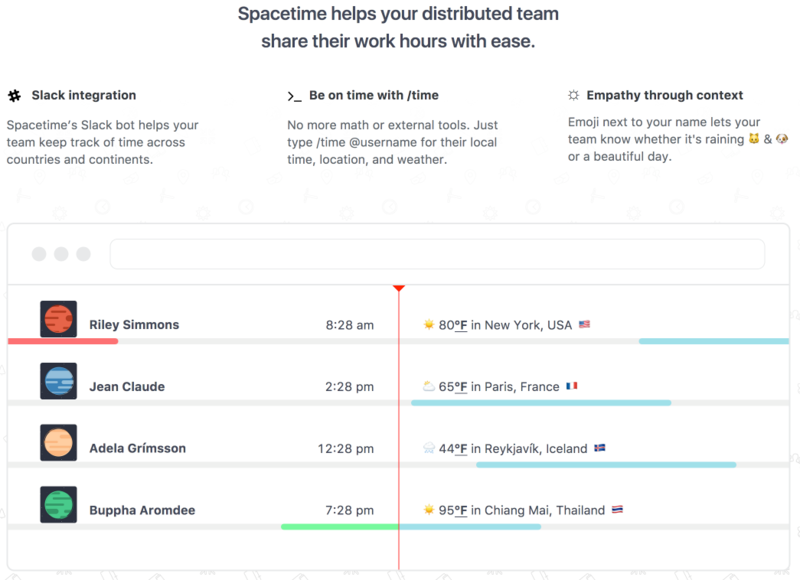 Spacetime.am lets you visualize teammate's online hours and has some sweet Slack integration that enables commands to show their work day schedule right from Slack. Working across time zones just takes a little thoughtfulness and practice. What techniques and strategies do you use to stay on top of multiple time zones? Crawling a new site - Warm welcome to Working Nomads! We've added a new job board to our long list of sites we crawl, bringing the total to a whopping 22! We're excited as always to extend a warm welcome to Working Nomads. From their About Us page, Working Nomads "connect(s) professionals who want to work remotely with innovative companies offering independent positions." Remotely Awesome Jobs will now show job posts for remote positions that are exclusive to Working Nomads. As always, a huge thanks for making Remotely Awesome Jobs your source for all the best Remote Jobs advertised on the interwebs, and make sure you're signed up for job alerts to ensure that you don't miss out on anything! It's no secret that I'm a big fan of Buffer, and the remote-first culture they work hard to embrace. I recently stumbled across a YouTube video from back in 2014 where Buffer founders Joel Gascione and Leo Widrich discuss how they came to decide to be remote-first, as well as the tools that enable them to build an effective workplace. Unfortunately, some of the tools they recommend (e.g., Sqwiggle and Hackpad) no longer exist! This reddit thread offers some alternatives to Sqwiggle, but most discussed alternatives to Hackpad seem to be small Wiki tools. Have any to recommend? Leave a note in the comments! Among the tools that do still exist are the venerable Hipchat and Trello. They sought advice from David Cancel when deciding to go remote, and there's a quote from him that stood out to me having been a remote worker for several years - he told the Buffer folks to either be remote-first, or not remote at all. Going part way where you have only a quarter or so of your workforce working remotely doesn't work well, and I have to agree. The full video is under 4 minutes and you can watch it above - enjoy! Remote Work Infographic - 'Cuz Infographics are Fun! It's been a while since we did one of these weekly round up things - there's still plenty abuzz about remote work every week, so let's do one for old time sake, shall we? The Visual Communications and Infographic wizards over at Piktochart shared 4 Skills Needed to be Successful at Remote Work, authored by Jacqueline Jensen. Jensen notes that "there appears to be a disconnect between how someone who has worked in a traditional work environment can acquire skills needed to excel in a remote role." BOSS Magazine notes that employees are often hesitant to relocate due to increased cost of living and commuting, and offers up Remote Work as a solution, concluding that "Remote work today can be a win-win for both employers and employees." Here is a cool Reddit discussion about weighing the digital nomad lifestyle against the desire to "settle down" and make long-term meaningful connections. Frank Liardett at Reffind explains why Remote Work is the best reward an employee can receive. Zapier's Melanie Pinola outlines the 7 Biggest Remote Work Challenges and How To Avoid Them. Hey all! Great news - we've added a new job board to the list of sites we crawl for remote jobs to TWENTY ONE. I know, crazy, right? We're psyched to extend a warm welcome to Hubstaff Talent. Hubstaff Talent is "a 100% free resource for companies looking to find remote talent across the globe," and now we're thrilled to include their job posts here, too. Another new source: Welcome Behance! We've started crawling another job board for remote design jobs - we'd love to extend a heartfelt welcome to Behance's job board! Behance's mission is "to empower the creative world to make ideas happen." Their community is part of the Adobe network, and itsports a job board that caters to creatives. There are a few remote nuggets in there, so our army of robots has started trawling through their posts for outstanding remote opportunities! I've been working remotely for about eight years now. I started off working for a small startup (which only lasted a few months before they ran out of funding), freelanced for a bit with several clients, and have worked for a couple companies since then. Contrary to what you might think, cultural differences among different remote jobs can vary a lot, even though you might be working in the same physical location for all of them. Some companies are chatty over Slack, while others are nearly silent. They may differ on how often you see your colleagues face to face. One job may be for a fast-paced startup with crazy deadlines and changing priorities while another might be a stuffy enterprise with lots of conference calls. I've struggled with clinical depression for years. I've been through many different medications and therapy to keep it in check. I try to stay fit, eat well, and make lifestyle choices with hope that I can keep it under control. Nevertheless, depression is a fickle thing, and it's hard to tell when or why it will rear its head to inflict its misery. I recently left a high-intensity job at a startup that I loved. I poured myself into it and personally created large parts of the technology that ran the company. I fell into the startup culture, believing we would change the world. Like most startups, things got a bit less rosy as time wore on. This wasn't because anything was wrong with that particular company. For me, it's just really hard to sustain the needed optimism for several years while you toil away trying to hit the jackpot. When I made the decision to was time to move on, I decided that I wanted to do something different for my next position. I chose to go back to agency work, and went into an area I didn't have a lot of expertise in to learn some new skills. The new company I work for is great. The people are fun, super-smart, and the benefits are fantastic. My first client is a large corporate enterprise with processes and policies and many layers of management. It was initially a culture shock, but I've adjusted to it. However, something wasn't quite right. The dark cloud of depression was threatening from the horizon. I tried to fend it off: I re-discovered my old running habit, adjusted my diet a bit, reduced my alcohol intake, but I wasn't able to stop it. Eventually I realized that the new job had something to do with it. I noticed my mood got a lot worse after the kids' summer vacation ended. My worst point of the day was usually right after the house emptied when the kids left for school and my wife went to work. I had trouble doing basic tasks and focusing, often until the afternoon. It was probably no coincidence that I got better when people started coming home from school and work. Why would this suddenly be a problem? As I said earlier, I've been working remotely for eight years. I recalled one other job where I got like this, during my freelancing era. The only commonality is that in both my new job and that job, I rarely get to physically see my colleagues. The jobs where I was happiest had (roughly) monthly visits where I'd see my co-workers or clients. So it was simple - I was just lonely. A frequent topic of remote work discussion is isolation. Working all by yourself for days on end can lead to loneliness, even if you think of yourself as a "loner." I didn't really think that isolation applied to me, but it did, I just didn't recognize it. To be honest, this was a disappointing realization. Being a remote worker is a huge part of my personal identity (heck, I built this site). I didn't want to have a problem with it. My wife suggested I should try co-working out. The idea honestly seems a little ridiculous. I have the luxury of being able to avoid working in an office. Why the heck would I pay money to commute to a place that lacks the comforts of home? It turns out humans are social creatures. Everyone is different, but some of us don't do so great without seeing their "tribe" on a recurring basis. I'm now an official member of Think Tank Portland. Co-working is a pretty recent change for me, but so far I feel a lot better. I haven't met a lot of the people here yet, but that doesn't seem to matter. And should I decide to return to freelancing someday, being part of a co-working community promises to yield some connections and provide meeting spaces I'll need. So why not just go to a coffee shop? I've done that, and there are a few things that make it less than ideal. It's not really a coffeeshop's job to be the perfect workplace - their job is to sell you coffee. The WiFi can be unreliable and slow. It can get noisy. The chairs and tables weren't designed to be ergonomic workspaces. It can be awkward to have a videoconference in a coffeeshop. Co-working spaces can provide rooms for video conferences, free coffee, proper work spaces, printers, and a sense of community in its members. A co-working space's entire business model revolves around making a comfy, hip environment to get stuff done in. Will I keep doing this? Time will tell. Maybe this latest bout with depression will resolve itself and I won't need to be here. Maybe the nature of my job will change. But for now, it's working. If you're a solo remote worker and feeling a little down, consider trying co-working out. We've heard a lot of feedback from you about the tags we use for filtering jobs. Specifically, we've tended to tag posts way too liberally. For example, let's say there's a job description that says "must work with QA to resolve issues." Often our tagger was pretty dumb and would slap a qa tag on that job. For people looking for quality assurance gigs, this is pretty annoying. A few minutes ago we pushed a new release out that tweaks our tagging algorithm a bit. Hopefully things will improve on all the new jobs we import going forward. We're not done yet, either. We hope to edit down our list of tags to make them more useful going forward. Stay tuned and keep that feedback coming in! So you've decided to take the plunge and start hiring remote team members. You've bought into the increased employee loyalty, efficiency, and workforce quality. Fantastic! What are some things you should do to be successful? If you're used to tapping into your usual network for finding candidates, you're probably going to miss out on some great new hires. You might not have noticed, but your personal network is probably fairly local and won't necessarily know a lot of remote candidates. How do you find remote workers? The most obvious place is to post to job boards that focus on remote work. We're obviously going to toot our own horn and recommend Remotely Awesome Jobs, but you should also check out the job boards we crawl to supplement the posts here. Find online communities where your candidates are. If you're looking for folks with a particular technical skill, figure out where they congregate. Looking for a Rails candidate? Try Ruby Now. Need an Ember developer? Go to their discussion forum's job posting category. See if there are Slack channels where an informal hiring question would be welcome (note: not all Slack channels will like this sort of intrusion, but some won't mind as long as you try to be polite and non-spammy). Blog Posts. Does your company have a blog? Post some targeted items about the culture you are trying to build, as well as technical posts that make your company sound like an interesting place to work. Because there's no "office" to hang out in, the nature of technical challenges becomes a bigger point of differentiation among remote jobs. It can be intimidating to come into work on your first day anywhere. It's even weirder for remote employees. There's no one to show you around, introduce you to people, teach you about the tools, etc. It's important to make sure your new hires don't show up on their first day, wondering "now what?" Make sure they have access to communication before their first day. Set your new hire up with Slack, email, accounts with your project management and source management tools, before their first day on the job. You wouldn't hire an on-site worker without giving them driving directions to the office. For remote workers, these tools are their lifeline, and logging into company chat is the closest analog to driving to the office. Document, Document, Document! This is important at any technical workplace, but doubly so for remote workers. When remote, it's impossible to poke your head into the next cubicle when you're colleague doesn't appear to be busy. It's harder to "just ask" about what/where/how whatever tools/logins/code/etc your company uses work. Clear, thorough documentation about processes and systems are key. Introductions. If you have a remote workforce, it's a good idea to have regular company all-hands meetings via video to stay connected. Another good use of this time is to give your new teammate a warm welcome, and a chance to put faces to chat handles. Make sure you've set up the right tools to communicate. How do you plan on doing video chats? Google Hangouts works just fine for most people. Chat room? Try Slack, Hipchat, or Flowdock. Do you plan on doing any pair programming? Maybe Screenhero will work for you. 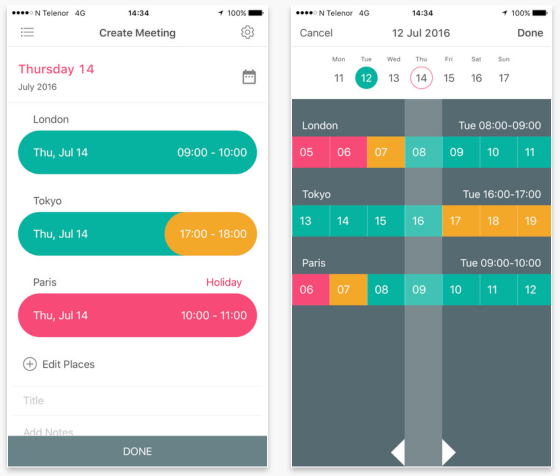 You'll need a project management tool that works well for remotes - you could do worse than Pivotal Tracker, Jira, Trello, or Asana. Make sure you have the right tools in place before you get started. Filling the job is more than a list of technical skills - this goes for onsite and remote employees. However, the right remote worker will need some additional skills you might not have considered. Are they going to be self-motivated when no one is around to tell them what to work on? Are they in a nearby timezone and what hours will they work? How are their communication skills, particularly over text? Try to capture these traits in your job description and screening. Internet. Remote workers all need high-speed internet. How about reimbursing it? Education reimbursement. Getting out of the house to attend some skill-sharpening conferences are always welcome, but hold a particular soft-spot for home-bound remote workers. Company Retreats. If you're lucky enough to be able to afford it, annual get togethers for face time are a great way to keep everyone on the same page and excited about your organization's goals. Home Office Expenses. Remote workers need to buy mundane things like staplers and post-it pads on their own, to say nothing about monitor upgrades or whiteboards. An allowance for such things goes a long way to show you care about remotes as much as an onsite teammate! What tips do you have for building a great remote team? Add yours to the comments below! Part-time foreign language teacher. Work remotely over the phone teaching your native language ($12-$15/hour).